106 Commerce Street, Suite 105 Lake Mary, FL 32746 TEL: 407.878.7606 • FAX: 407.878.7611 Order additional copies at GuidelineCentral.com Copyright © 2019 All rights reserved ATSHOM1922a Disclaimer is pocket guide attempts to define principles of practice that should produce high-quality patient care. It is applicable to specialists, primary care, and providers at all levels. is pocket guide should not be considered exclusive of other methods of care reasonably directed at obtaining the same results. e ultimate judgment concerning the propriety of any course of conduct must be made by the clinician aer consideration of each individual patient situation. Neither IGC, the medical associations, nor the authors endorse any product or service associated with the distributor of this clinical reference tool. Abbreviations ATS, American oracic Society; HOT, Home oxygen therapy; P a O 2 , partial pressure of oxygen in arterial blood, S p O 2 , peripheral capillary oxygen saturation Source Hayes, D Jr., Wilson KC, Krivchenia K, Hawkins SMM, Balfour-Lynn IM, Gozal D, Panitch HB, Splaingard ML, Rhein LM, Kurland G, Abman SH, Hoffman TM, Carroll CL, Cataletto ME, Tumin D, Oren E, Martin RJ, Baker J, Porta GR, Kaley D, Gettys A, Deterding RR; on behalf of the American oracic Society Assembly on Pediatrics. Home Oxygen erapy for Children: An Official ATS Clinical Practice Guideline Quality of Evidence Grades and Strength of Recommendations Grade Definition High We are very confident that the true effect lies close to that of the estimate of the effect. Moderate We are moderately confident in the effect estimate: e true effect is likely to be close to the estimate of the effect, but there is a possibility that it is substantially different Low Our confidence in the effect estimate is limited: e true effect may be substantially different from the estimate of the effect. 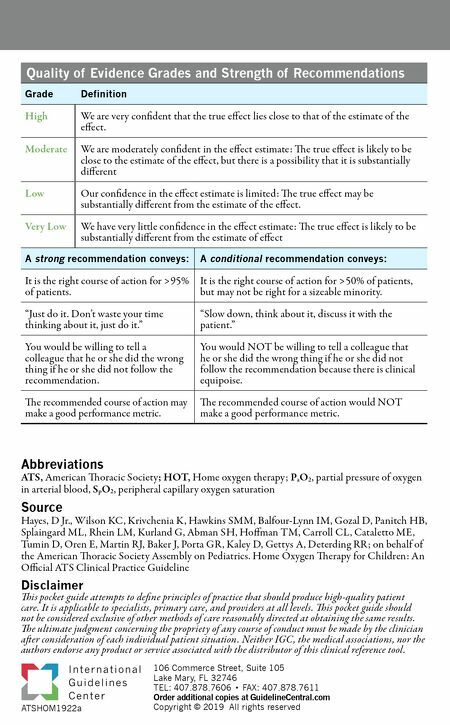 Very Low We have very little confidence in the effect estimate: e true effect is likely to be substantially different from the estimate of effect A strong recommendation conveys: A conditional recommendation conveys: It is the right course of action for >95% of patients. It is the right course of action for >50% of patients, but may not be right for a sizeable minority. "Just do it. Don't waste your time thinking about it, just do it." "Slow down, think about it, discuss it with the patient." You would be willing to tell a colleague that he or she did the wrong thing if he or she did not follow the recommendation. You would NOT be willing to tell a colleague that he or she did the wrong thing if he or she did not follow the recommendation because there is clinical equipoise. e recommended course of action may make a good performance metric. e recommended course of action would NOT make a good performance metric.